Washington, DC - Washington Humane Society -Washington Animal Rescue League Animal Control and Humane Law Enforcement Officers have removed 63 cats and kittens from a home in Northwest Washington following a case of hoarding and inhumane treatment of animals. The animals belonged to two women who had been living illegally in the residence. On Tuesday evening, July 19, WHS-WARL Officers reported to the 800 block Decatur Avenue, NW after being contacted by the realtor for the home. Officers arrived to find 63 cats on the property. Of those 63 cats, 27 are kittens under one month old. Upon entering the house, officers observed deplorable conditions inside, with feces located throughout the house both inside and outside of litter boxes. There were between 20 -25 cats located inside the home. Further investigation revealed a U-Haul van in the rear of the building containing approximately 20 adult cats and more than 30 kittens of various ages. Many of the cats and kittens are suffering from Upper Respiratory Infections, are underweight, and were overheated due to confinement in the U-Haul trailer. Officers removed 38 cats and kittens on Tuesday evening and returned to the property Wednesday to remove the remaining animals. The cats and kittens were immediately taken to the Animal Care facility at New York Avenue where they will be evaluated by WHS-WARL medical staff. This WHS-WARL Humane Law Enforcement case remains under investigation. The special adoption event referred to is Clear the Shelters, an annual national program that offers fee-waived adoptions to qualified adopters on Saturday, July 23 from 10 a.m. – 5 p.m. Both WHS-WARL Adoption Centers (71 Oglethorpe Street, NW and 1201 New York Avenue, NE) will be open for this program. WHS-WARL Officers recovered 44 cats and kittens from the home. 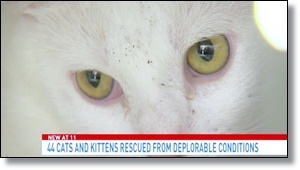 The residents of the home took approximately 20 cats when they left the address overnight. The Pet Tree House will keep you updated on their availability for adoption. Please share with family, friends, co-workers and neighbors.